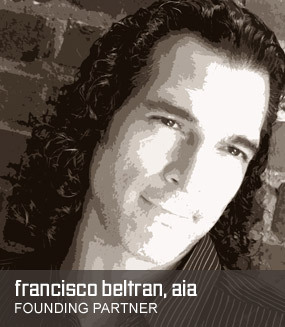 Francisco is an award-winning architect and AIA member licensed in DC, Maryland, Virginia, and Florida with over 25 years experience in the restaurant and nightclub industry and 20 of those years in architecture and interior design. Francisco first honed his architectural skills at Lloyd Lamont Design and Adamstein & Demetriou, ultimately branching out on his own with Design Republica (formerly Beltran Design Group). From his early days bussing tables in his uncle’s restaurant to working with four star chefs such as Victorio Testa, Roberto Donna, and Jeff Buben, Francisco absorbed a visceral knowledge of restaurant and nightclub operations from the front to the back of the house. It’s this unique perspective that help define Francisco’s philosophy for collaboration and beautiful design coupled with his instinctual grasp on how intelligent space design can impact an organization’s ability to serve its clientele effectively and profitably. Francisco’s formal education consists of a Bachelor of Architecture degree and an Arts and Sciences degree from Catholic University of America along with completed studies at two esteemed Honors Programs in Europe: the Rhode Island School of Design in Italy, and L’Ecole Des Beaux Arts in France. Enoc provided collaborative design drawings and 3-D modeling for the Tennis sports facility of the Pan American games in 2003, the Uvero Alto Resorts, the White Sand Resorts project, the Samana Seaside project, the Club Bonito Hotel, the Oscar de la Renta Villas Golf, Punta Cana, and the Cerro Gordo Urbanization project, Santo Domingo. Enoc has experience in all phases of the architectural process; schematic design, design development, construction documents, and construction observation. As a 3-D modeler he can generate models for projects ranging from small office interiors to grand high-end resorts. His specialized knowledge about lighting allows for the creation of detailed models at any time of day. And his level of professionalism and attention to detail ensures that project objectives are always met. 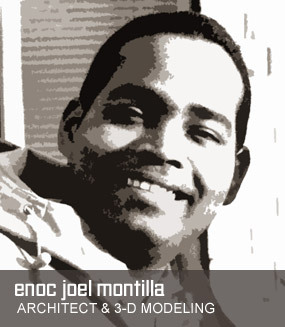 Enoc oversees all 3-D modeling at Design Republica.